Cynthia Ona Innis is a visual artist, currently living and working in Berkeley, California. Innis received a BA from the University of California at Berkeley and a MFA from Mason Gross School of the Arts, Rutgers University. Her mixed media paintings are included in the permanent collections of the San Jose Museum of Art, the collection of the US State Department Art in Embassies, the Berkeley Art Museum Pacific Film Archive and the Fine Arts Museums of San Francisco. 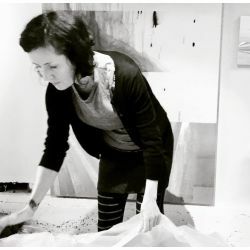 Among awards she has received are two James D. Phelan Awards, one for printmaking and another for painting, a MacDowell Colony Fellowship and residency, a Kala Fellowship and residency and a 2014 Sustainable Arts Foundation Award. Innis has been a visiting art professor at the San Francisco Art Institute, the University of California at Berkeley, San Francisco State University and the Maine College of Art. With representation in Los Angeles at the Walter Maciel Gallery, Innis exhibits throughout the United States as well as internationally.